Hey there, welcome to the day one of the June Neat and Tangled release. The first stamp set up is called So Fly and it sure is! It's a cute little stamp set that's perfect for creating whimsical cards. This card was created with the new June release stencil and a background wash with Distress Oxide Ink in Tumbled Glass and Broken China. The stamped images were colored with Copics and placed on foam tape for a bit of lift. 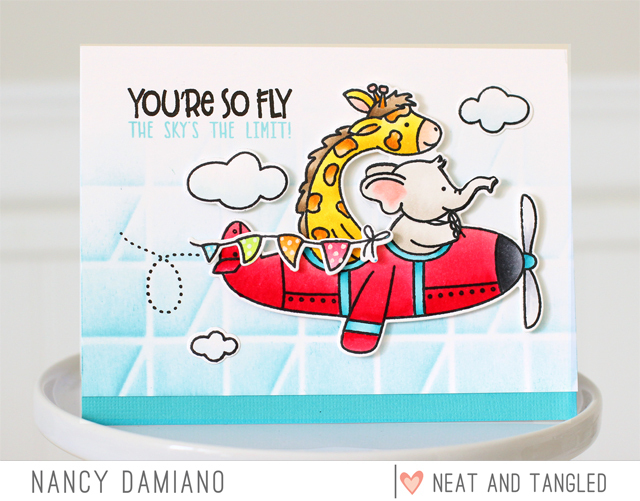 Neat and Tangled will be giving away a So Fly stamp set on Friday. To enter, leave a comment below to be entered. Be sure to visit the Neat and Tangled blog! Cute--I like your coloring and the unique background. 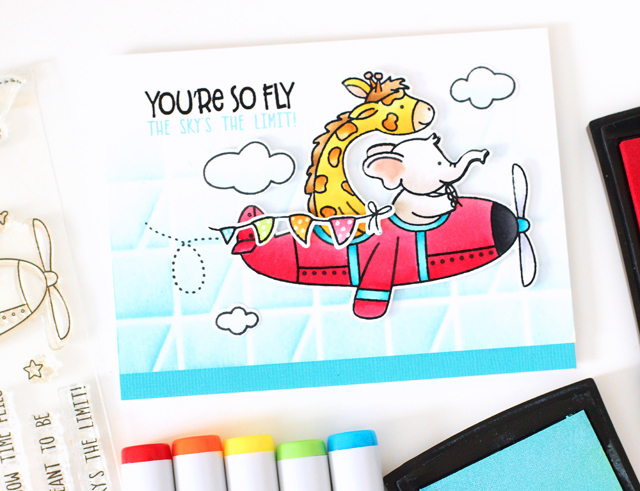 Your card is adorable and the colors are bright and cheerful! Super cute! Love the background too! The background is great! I love the colors! And of course the beautiful coloring! Gorgeous card Nancy - and I love your stencilled background! This looks great. Your coloring looks awesome and I love how you did the background. Such a fun and bright creation! Sooo cute!! the stenciled background and the dotted banners are so fun!! Super cute with the stenciled background! Love this fun card! Love that soft stenciled background and of course this fun image from Elena! Really great cards, especially your choice of color palette & style of background. Sweet card and darling image. Love the soft look. Oh my! This is so stinkin' cute!!! Gorgeous colors!!! Wow!! Great dimension added for interest in the BG!! And who doesn't want a red plane???!!!!! This is so cute! :) The background is very subtle and interesting. Adorable card! Love these cute critters! Fabulous background! Loving that soft stenciled background and the critters are adorable! Nancy, this is adorable. I love the stencil background too! Love the bright colors you used. How adorable are these two !! !